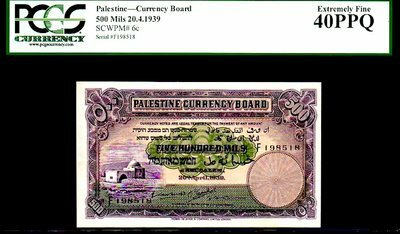 PALESTINE P6c 1939 500 MILS PCGS 40PPQ! ONLY 20 GRADED "TOTAL BY ALL GRADING CO'S!!!" FEATURING "RACHEL'S TOMB" AND "TOWER OF DAVID" VERY RARE IN THIS CONDITION, EXCELLENT CENTERING, SHARP CORNERS, ZERO DISTRACTIONS! The Tower of David, also known as the Jerusalem Citadel, is an ancient citadel located near the Jaffa Gate entrance to the Old City of Jerusalem. The citadel that stands today dates to the Mamluk and Ottoman periods. It was built on the site of an earlier ancient fortification of the Hasmonean, Herodian, Christian and Arab-Muslim eras, but was destroyed after the Mamluk conquest of Jerusalem. It contains important archaeological finds dating back over 2,000 years including a quarry dated to the First Temple period, and is a popular venue for benefit events, craft shows, concerts, and sound-and-light performances. This site is believed to be the burial place of the biblical matriarch Rachel, wife of Jacob and mother of two of his twelve sons. She died giving birth to Benjamin and "Jacob set a pillar upon her grave" (Gen. 35:19). For Jews, Rachel's Tomb is the third holiest site after the Temple Mount in Jerusalem and the Cave of the Patriarchs in Hebron. It has become an important place of Jewish pilgrimage, especially Jewish women unable to give birth. 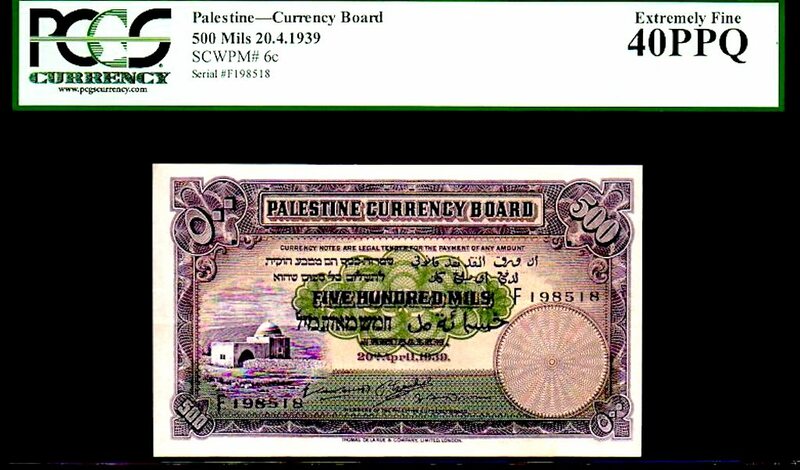 PALESTINE P6c 1939 500 MILS PCGS 25! FEATURING "RACHEL'S TOMB" AND "TOWER OF DAVID" THIS PIECE IS ABSOLUTELY INCREDIBLE - LOOKS ALMOST GEM+++! EXCELLENT CENTERING, SHARP CORNERS, ZERO DISTRACTIONS, LITERALLY LOOKS LIKE A SUPERB GEM ! Jewish tradition has it that Rachel weeps for her children and that when the Jews were taken into exile, she wept as they passed by her grave on the way to Babylon (Jeremiah 31:11-16). The structure on the site, a cube topped by a dome, was built around 1620 by the Ottoman Turks. 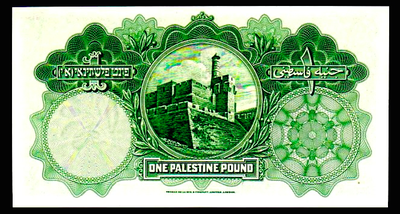 It was lengthened in 1860 by Sir Moses Montefiore. In the 1990's, due to the deteriorating security situation, the original domed structure was fortified and enclosed inside a building with a hall from the entrance. Recently, the site has been surrounded by a barrier to separate it from Bethlehem. PALESTINE P6b 1929 500 MILS PMG 35! ONLY 20 GRADED "TOTAL BY ALL GRADING CO'S!!!" FEATURING "RACHEL'S TOMB" AND "TOWER OF DAVID" THIS PIECE IS ABSOLUTELY INCREDIBLE - LOOKS ALMOST GEM+++! VERY RARE IN THIS CONDITION, WE'VE NOT SEEN HIGHER (IN ALMOST 20 YEARS)! EXCELLENT CENTERING, SHARP CORNERS, ZERO DISTRACTIONS, LITERALLY LOOKS LIKE A SUPERB GEM ! 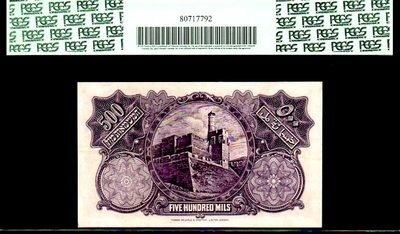 PALESTINE P6c "RACHEL'S TOMB - JERUSALEM" 20.4.1939 500 MILS "TOWER OF DAVID" GRADED CGC 40PQ EXTREMELY FINE!! 3rd FINEST CGC!! PALESTINE P6c 20.4.1939 500 MILS CGC 45PQ TIED FOR 2nd FINEST KNOWN CGC IN 14 YEARS OF GRADING! FEATURING "RACHEL'S TOMB" AND "TOWER OF DAVID" THIS PIECE IS ABSOLUTELY INCREDIBLE - LOOKS ALMOST GEM+++! VERY RARE IN THIS CONDITION, WE'VE NOT SEEN HIGHER (IN ALMOST 20 YEARS)! EXCELLENT CENTERING, SHARP CORNERS, ZERO DISTRACTIONS, LITERALLY LOOKS LIKE A SUPERB GEM ! 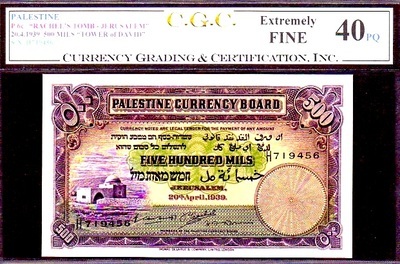 PALESTINE P6c 20.4.1939 500 MILS PCGS 58PPQ & CGC 58PQ NEW FINEST KNOWN CGC IN 14 YEARS OF GRADING! FEATURING "RACHEL'S TOMB" AND "TOWER OF DAVID" THIS PIECE IS ABSOLUTELY INCREDIBLE - LOOKS ALMOST GEM+++! VERY RARE IN THIS CONDITION, WE'VE NOT SEEN HIGHER (IN ALMOST 20 YEARS)! EXCELLENT CENTERING, SHARP CORNERS, ZERO DISTRACTIONS, LITERALLY LOOKS LIKE A SUPERB GEM ! 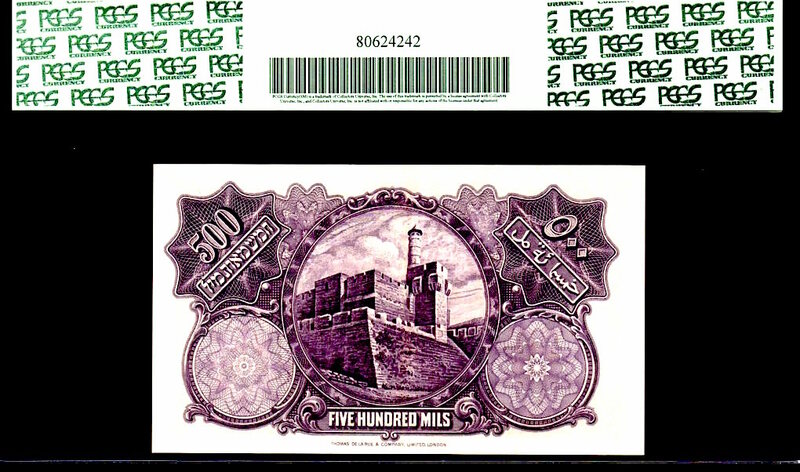 "RACHEL'S TOMB- TOWER OF DAVID"
PALESTINE P6c 1939 500 MILS RAW! ONLY 20 GRADED "TOTAL BY ALL GRADING CO'S!!!" FEATURING "RACHEL'S TOMB" AND "TOWER OF DAVID" VERY RARE IN THIS CONDITION, EXCELLENT CENTERING, SHARP CORNERS, ZERO DISTRACTIONS! PICK # 7b PALESTINE 1 POUND, DATED 30.9.29 "JERUSALEM - TOWER OF DAVID on back and DOME OF THE ROCK (housed the ARK of the COVENANT) featured on front" IN CGC 30PQ RARITY. CGC's 2nd FINEST KNOWN! EXTENSIVE RESEARCH HAS FOUND (BY ALL GRADING CO'S WE WERE ABLE TO FIND) THAT ALL OTHER GRADING CO'S HAVE ALSO 15 HIGHER, WITH A TOTAL OF ONLY 52 TOTAL CERTIFIED! 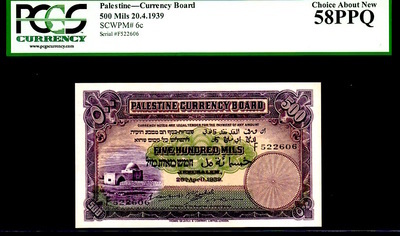 THE 1929 IS ABOUT TWICE AS RARE AS THE 1939. COLLECTORS REALIZING THE TRUE RARITY OF THESE HISTORICAL NOTE TYPES, AND THE WILLINGNESS COLLECTORS HAVE STEPPED UP THEIR GAME IN BOTH PRICING AND DEMAND! THIS IS CERTAINLY A RARE AND SELDOM SEEN OPPORTUNITY! PALESTINE P7b 1 POUND, DATED 30.9.29 "JERUSALEM - TOWER OF DAVID on back and DOME OF THE ROCK (housed the ARK of the COVENANT) featured on front" IN CGC 45PQ RARITY. CGC's FINEST KNOWN! EXTENSIVE RESEARCH HAS FOUND (BY ALL GRADING CO'S WE WERE ABLE TO FIND) THAT ALL OTHER GRADING CO'S HAVE ALSO 14 HIGHER, WITH A TOTAL OF ONLY 52 TOTAL CERTIFIED! 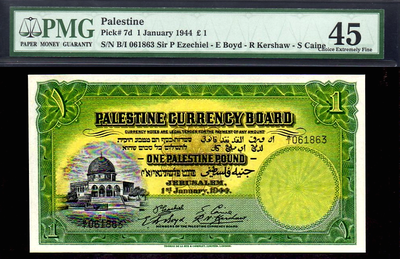 THE 1929 IS ABOUT TWICE AS RARE AS THE 1939. 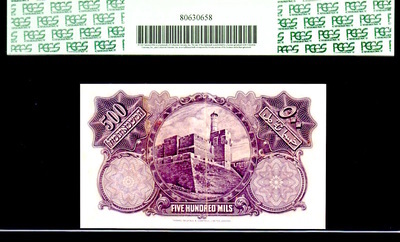 COLLECTORS REALIZING THE TRUE RARITY OF THESE HISTORICAL NOTE TYPES, AND THE WILLINGNESS COLLECTORS HAVE STEPPED UP THEIR GAME IN BOTH PRICING AND DEMAND! THIS IS CERTAINLY A RARE AND SELDOM SEEN OPPORTUNITY! 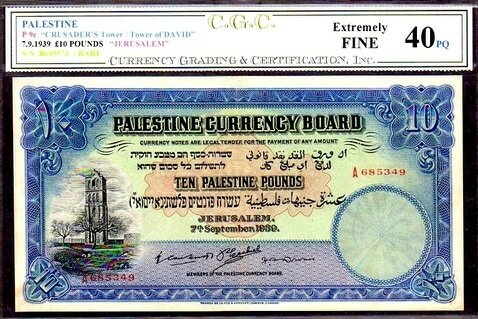 PALESTINE P7c "TOWER OF DAVID" 20.4.1939 1 POUND "JERUSALEM" GRADED CGC 40PQ EXTREMELY FINE!! "JERUSALEM - TOWER OF DAVID (BACK) & DOME OF THE ROCK (FRONT), WHICH HOUSED THE "ARK OF THE COVENANT." THIS PIECE IS EXTREMELY SOUGHT AFTER BY THE MOST ADVANCED OF COLLECTORS! A VERY RARE OPPORTUNITY! 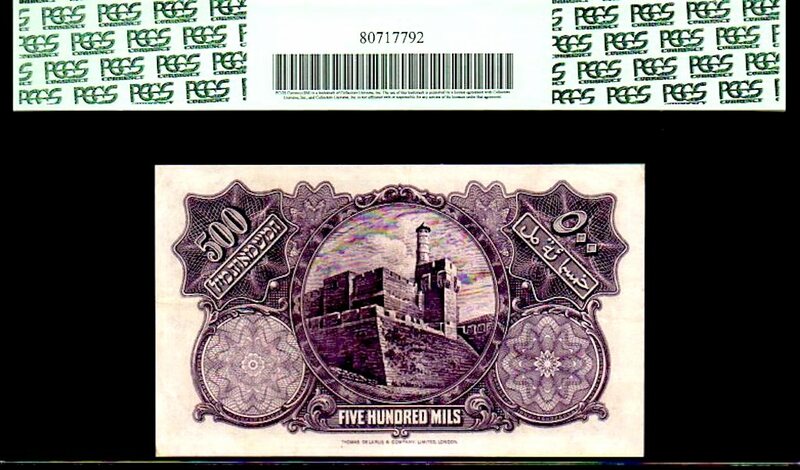 PALESTINE P7c "TOWER OF DAVID" 20.4.1939 1 POUND "JERUSALEM" GRADED PMG 55 ALMOST UNCIRCULATED!! "JERUSALEM - TOWER OF DAVID (BACK) & DOME OF THE ROCK (FRONT), WHICH HOUSED THE "ARK OF THE COVENANT." THIS PIECE IS EXTREMELY SOUGHT AFTER BY THE MOST ADVANCED OF COLLECTORS! A VERY RARE OPPORTUNITY! PALESTINE P7c dated 20.4.1939 1 POUND - TIED FOR 2ND FINEST KNOWN CGC 65PQ! ***ONLY 3 UNC'S KNOWN!!! THE OTHER TWO ARE LOCKED UP FOR A VERY VERY LONG TIME IN ADVANCED COLLECTIONS! 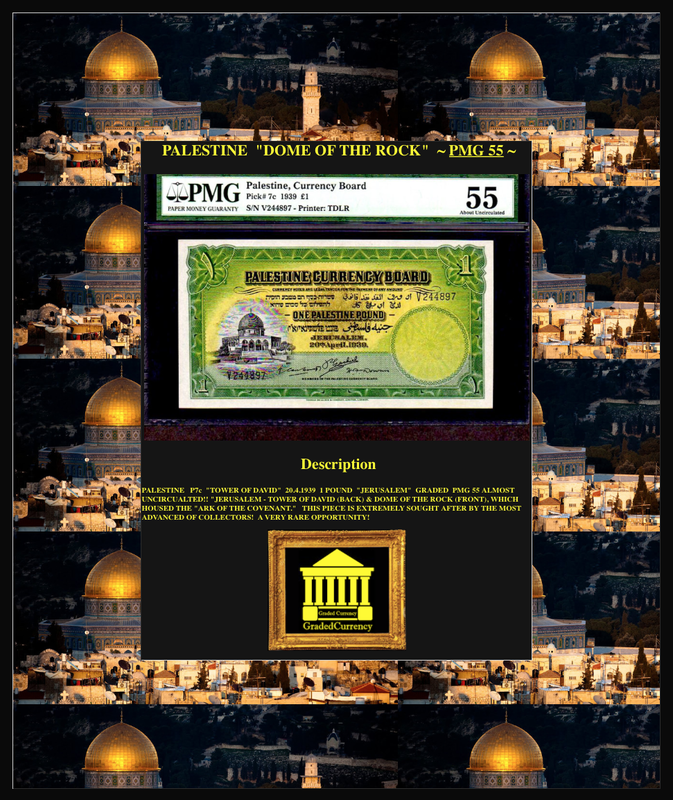 "JERUSALEM - TOWER OF DAVID (BACK) & DOME OF THE ROCK (FRONT), WHICH HOUSED THE "ARK OF THE COVENANT." THIS PIECE IS EXTREMELY SOUGHT AFTER BY THE MOST ADVANCED OF COLLECTORS! A VERY RARE OPPORTUNITY! PALESTINE P7c 1 POUND, DATED 20.4.1939 "JERUSALEM - TOWER OF DAVID on back and DOME OF THE ROCK featured on front" IN PCGS 63!!! WE'VE BEEN DOING EBAY FOR ALMOST 12 YEARS NOW AND HAVE NEVER KNOWN THIS NOTE TYPE TO EVER BE OFFERED ON EBAY IN UNCIRCULATED CONDITION!!! 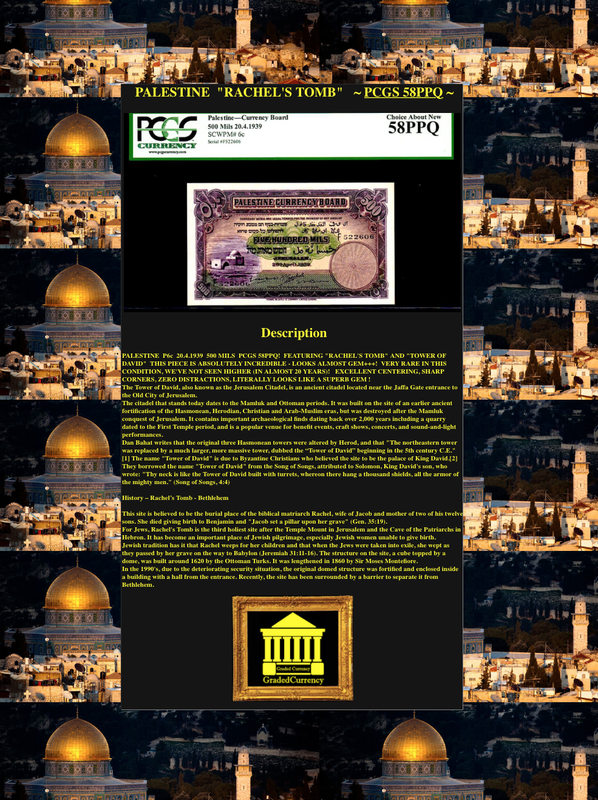 THESE ARE NOTES ARE ORIGINAL AND REFLECT THE TRUE BEAUTY OF THE COUNTRY AND THE RELIGIOUS SITE. WE CONSIDER IT AN HONOR TO BOTH HANDLE AND OFFER SUCH SPECIAL PIECES TO THE OPEN MARKETPLACE! 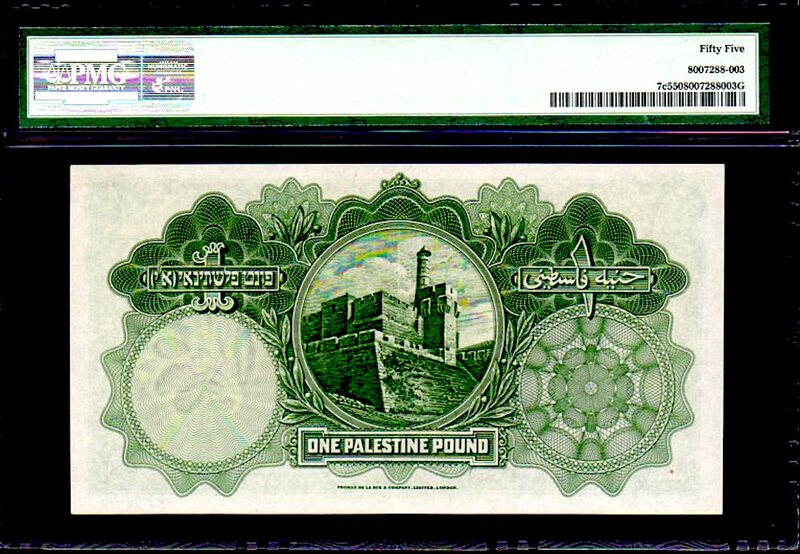 PALESTINE P7c P1 POUND, DATED 20.4.1939 "JERUSALEM - TOWER OF DAVID on back and DOME OF THE ROCK featured on front" CGC 67PQ - FINEST KNOWNS!!! WE'VE BEEN DOING EBAY FOR ALMOST 12 YEARS NOW AND HAVE NEVER KNOWN THIS NOTE TYPE TO EVER BE OFFERED ON EBAY IN UNCIRCULATED CONDITION, LET ALONE TWO CONSECUTIVE SERIAL # GEMS!!! 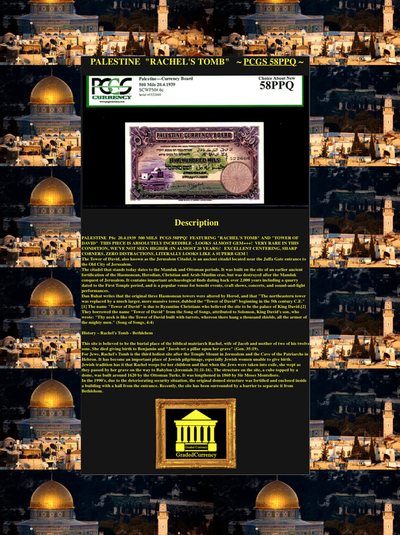 (SEE NOTE ABOVE) THESE ARE NOTES ARE ORIGINAL AND REFLECT THE TRUE BEAUTY OF THE COUNTRY AND THE RELIGIOUS SITE. WE CONSIDER IT AN HONOR TO BOTH HANDLE AND OFFER SUCH SPECIAL PIECES TO THE OPEN MARKETPLACE! 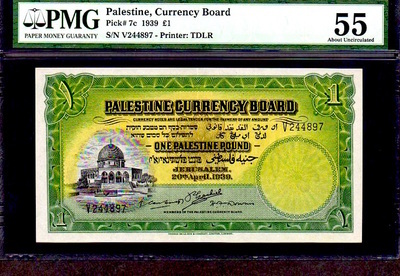 PALESTINE P7d dated 1.1.1944 1 POUND - FINEST KNOWN PMG 45! 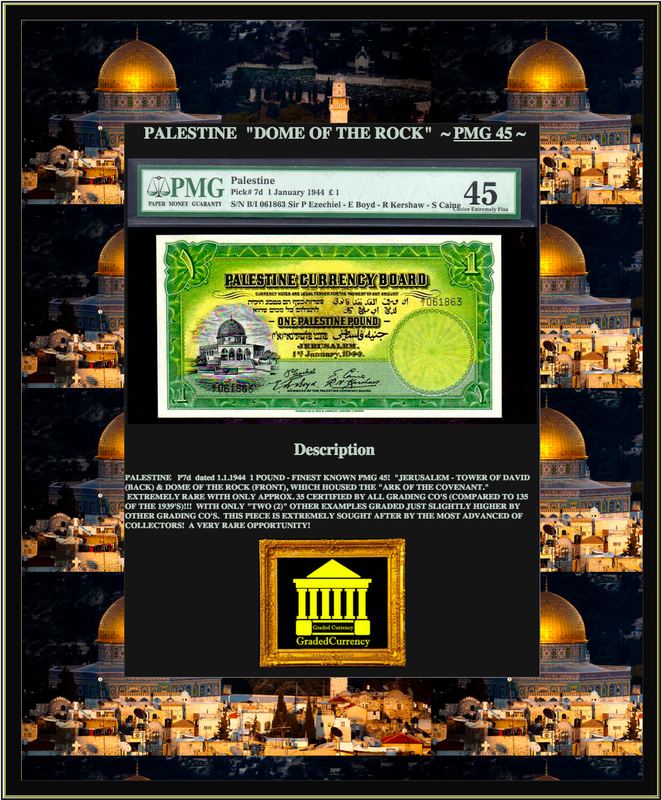 "JERUSALEM - TOWER OF DAVID (BACK) & DOME OF THE ROCK (FRONT), WHICH HOUSED THE "ARK OF THE COVENANT." EXTREMELY RARE WITH ONLY APPROX. 35 CERTIFIED BY ALL GRADING CO'S (COMPARED TO 135 OF THE 1939'S)!!! WITH ONLY "TWO (2)" OTHER EXAMPLES GRADED JUST SLIGHTLY HIGHER BY OTHER GRADING CO'S. THIS PIECE IS EXTREMELY SOUGHT AFTER BY THE MOST ADVANCED OF COLLECTORS! A VERY RARE OPPORTUNITY! 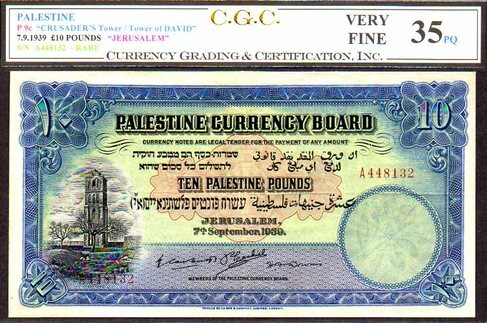 PALESTINE P8b DATED 1.1.1929 5 POUNDS GRADED FINEST KNOWN by CGC 35PQ! RARE-ONLY 12 TOTAL EVER CERTIFIED BY ALL GRADING CO'S AND ONLY 1 or 2 OF THOSE ARE JUST "SLIGHTLY HIGHER BUT CERTAINLY COULD NOT LOOK ANY NICER THAN THIS PIECE, WITH IT'S DEEP RICH ORANGE INKS, EXTREMELY WELL BALANCED CENTERING, AND RAZOR SHARP CORNERS!" 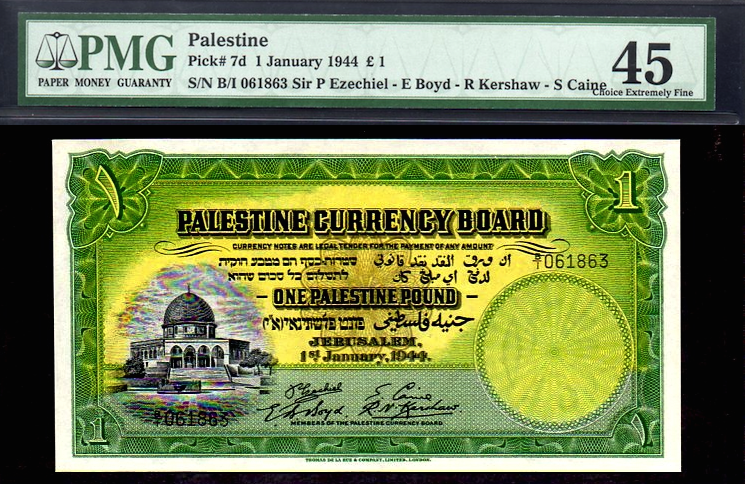 I HAVE TO BELIEVE THIS IS "THE NICEST LOOKING 1929 5 POUND IN EXISTENCE! "CRUSADER'S TOWER" BUILT IN THE 1200'S (13TH CENTURY)! VERY VERY VERY RARE - THIS IS "THE" FINEST KNOWN BY ALL GRADING CO'S THAT WE COULD FIND (ACTUALLY TIED WITH 1 OTHER 45 XF THAT IS "MOST" CERTAINLY BURIED FOR THE AGES!). THIS PIECE BRINGS GREAT EXCITEMENT, AS IT CAN NOT BE UNDERSCORED ENOUGH THE ABSOLUTE PRISTINE - TOTALLY ORIGINAL STATE OF THE NOTE!" I'VE VIEWED SEVERAL OF THIS NOTE TYPE OVER THE LAST 15 YEARS AND HAVE "NOT!" SEEN ANOTHER ORIGINAL PIECE WITHOUT REPAIRS OR REMOVED GRAFFITI. THE COLLECTOR BASE FOR SUCH A PIECE IS EMENSE AND THE SUPPLY IS EXTREMELY LOW. THROUGH EXTENSIVE RESEARCH I'VE BEEN ABLE TO LOCATED JUST 29 CERTIFIED EXAMPLES IN TOTAL - WITH ONLY 2 IN XF 40 AND 1 OTHER IN 45 (NO PQ'S!). THE HISTORICAL SIGNIFICANCE OF THIS PIECE IS MONUMENTAL - FOR CHRISTIANS, JUDAISM AND MUSLIMS. 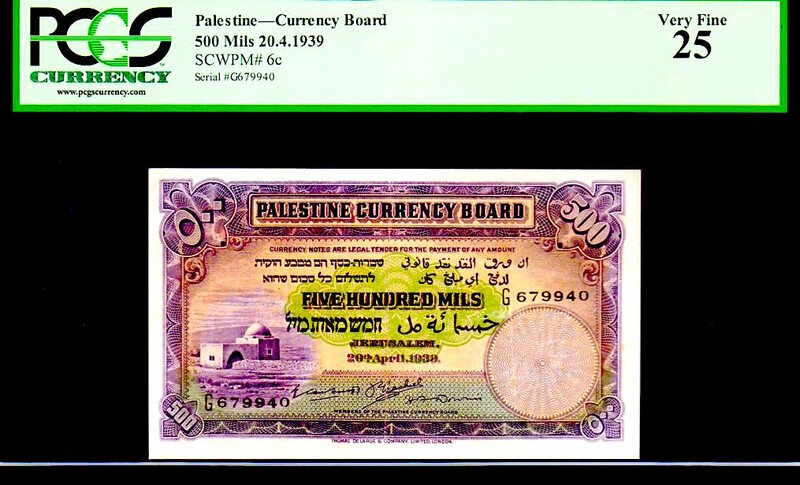 ALSO SIGNIFICANT ARE THE 500 MILS (RACHEL'S TOMB - JACOB'S WIFE), THE 1 POUND (TEMPLE MOUNT- DOME OF THE ROCK (BUILT BY KING SOLOMON/ HOUSE OF THE "ARK OF THE COVENANT" - WHERE JESUS VISITED, AND WHERE PROPHET MUHAMMAD'S JOURNEY TO THE HEAVEN-IN Qur'an). ALSO THE CRUSADER'S FOUND THE BONES OF "SAMEUL" THE BIBLICAL PROPHET, WERE DISCOVERED IN THE CEMETARY WITHIN RAMLEH, NEAR A JEWISH SYNAGOGUE (AS WRITTEN BY RABBI BENJAMIN OF TUDELA IN 1163). THE WHOLE SERIES IS SPECIAL REMINDER OF A VERY SIGNIFICANT HISTORICAL PLACE FOR ALL HUMANITY! IT IS QUITE A HONOR TO BE ABLE TO OFFER SUCH A PRECIOUS TREASURE IN THE OPEN MARKET FOR ALL TO ENJOY! 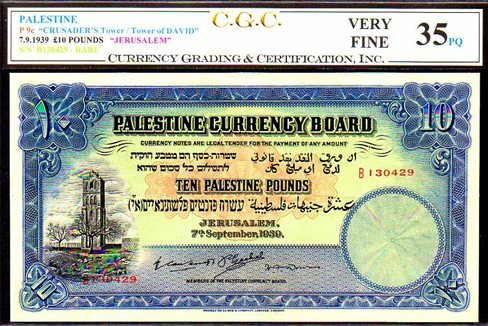 PALESTINE P8d DATED 1.1.1944 5 POUNDS GRADED FINEST KNOWN by CGC 35PQ! 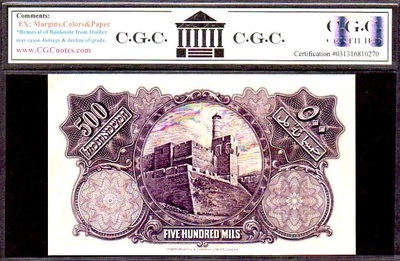 RARE-ONLY 28 TOTAL EVER CERTIFIED BY ALL GRADING CO'S AND ONLY 8 OF THOSE ARE "SLIGHTLY HIGHER" (MAINLY 40'S) GRADES "CRUSADER'S TOWER" BUILT IN THE 1200'S (13TH CENTURY)! VERY VERY VERY RARE - THIS IS "THE" FINEST KNOWN BY ALL GRADING CO'S THAT WE COULD FIND (ACTUALLY TIED WITH 1 OTHER 45 XF THAT IS "MOST" CERTAINLY BURIED FOR THE AGES!). THIS PIECE BRINGS GREAT EXCITEMENT, AS IT CAN NOT BE UNDERSCORED ENOUGH THE ABSOLUTE PRISTINE - TOTALLY ORIGINAL STATE OF THE NOTE!" I'VE VIEWED SEVERAL OF THIS NOTE TYPE OVER THE LAST 15 YEARS AND HAVE "NOT!" SEEN ANOTHER ORIGINAL PIECE WITHOUT REPAIRS OR REMOVED GRAFFITI. THE COLLECTOR BASE FOR SUCH A PIECE IS EMENSE AND THE SUPPLY IS EXTREMELY LOW. THROUGH EXTENSIVE RESEARCH I'VE BEEN ABLE TO LOCATED JUST 29 CERTIFIED EXAMPLES IN TOTAL - WITH ONLY 2 IN XF 40 AND 1 OTHER IN 45 (NO PQ'S!). THE HISTORICAL SIGNIFICANCE OF THIS PIECE IS MONUMENTAL - FOR CHRISTIANS, JUDAISM AND MUSLIMS. 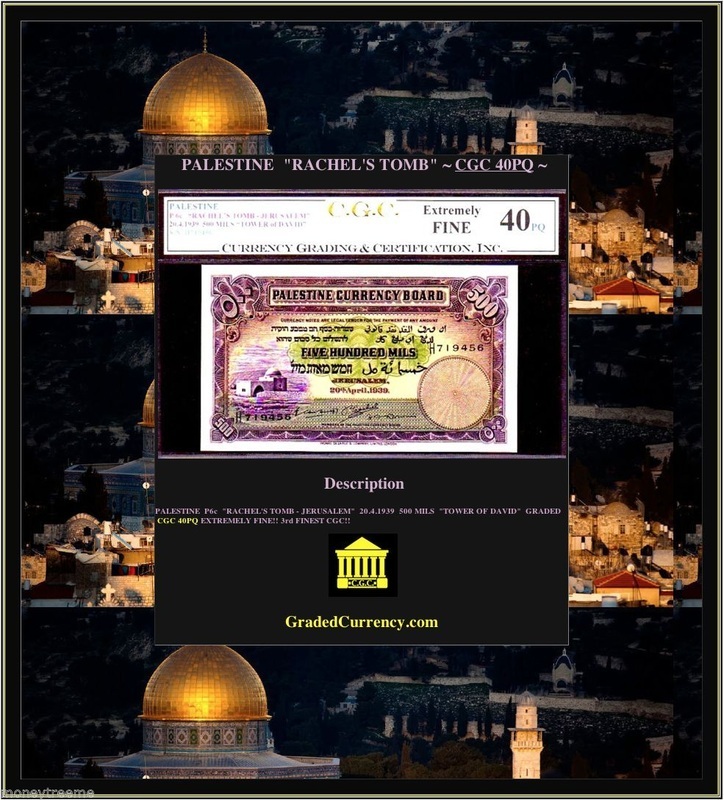 ALSO SIGNIFICANT ARE THE 500 MILS (RACHEL'S TOMB - JACOB'S WIFE), THE 1 POUND (TEMPLE MOUNT- DOME OF THE ROCK (BUILT BY KING SOLOMON/ HOUSE OF THE "ARK OF THE COVENANT" - WHERE JESUS VISITED, AND WHERE PROPHET MUHAMMAD'S JOURNEY TO THE HEAVEN-IN Qur'an). ALSO THE CRUSADER'S FOUND THE BONES OF "SAMEUL" THE BIBLICAL PROPHET, WERE DISCOVERED IN THE CEMETARY WITHIN RAMLEH, NEAR A JEWISH SYNAGOGUE (AS WRITTEN BY RABBI BENJAMIN OF TUDELA IN 1163). THE WHOLE SERIES IS SPECIAL REMINDER OF A VERY SIGNIFICANT HISTORICAL PLACE FOR ALL HUMANITY! IT IS QUITE A HONOR TO BE ABLE TO OFFER SUCH A PRECIOUS TREASURE IN THE OPEN MARKET FOR ALL TO ENJOY! 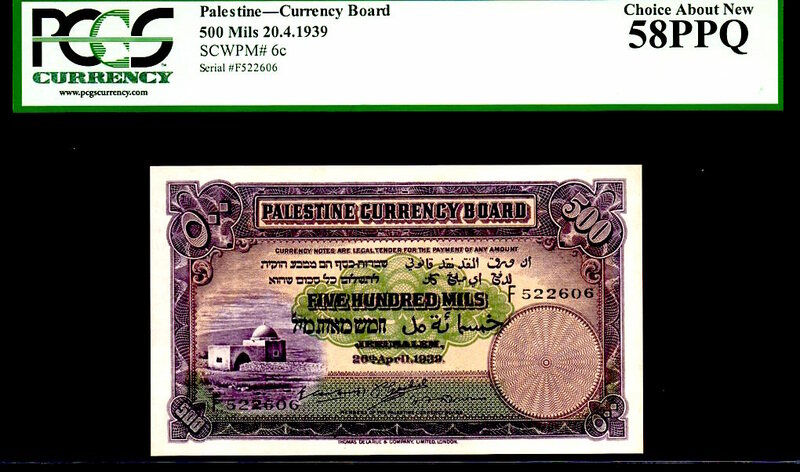 PALESTINE P8d DATED 1.1.1944 5 POUNDS GRADED FINEST KNOWN by CGC 45PQ! 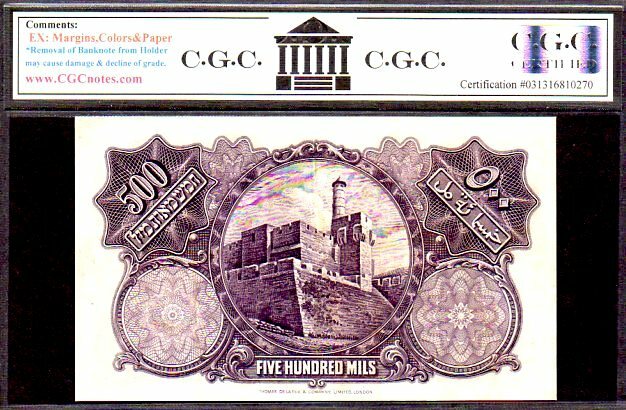 RARE-ONLY 28 TOTAL EVER CERTIFIED BY ALL GRADING CO'S AND ONLY 1 OF THOSE ARE JUST "SLIGHTLY HIGHER" (MAINLY 53) GRADES "CRUSADER'S TOWER" BUILT IN THE 1200'S (13TH CENTURY)! VERY VERY VERY RARE - THIS IS "THE" FINEST KNOWN BY ALL GRADING CO'S THAT WE COULD FIND (ACTUALLY TIED WITH 1 OTHER 45 XF THAT IS "MOST" CERTAINLY BURIED FOR THE AGES!). THIS PIECE BRINGS GREAT EXCITEMENT, AS IT CAN NOT BE UNDERSCORED ENOUGH THE ABSOLUTE PRISTINE - TOTALLY ORIGINAL STATE OF THE NOTE!" I'VE VIEWED SEVERAL OF THIS NOTE TYPE OVER THE LAST 15 YEARS AND HAVE "NOT!" SEEN ANOTHER ORIGINAL PIECE WITHOUT REPAIRS OR REMOVED GRAFFITI. THE COLLECTOR BASE FOR SUCH A PIECE IS EMENSE AND THE SUPPLY IS EXTREMELY LOW. THROUGH EXTENSIVE RESEARCH I'VE BEEN ABLE TO LOCATED JUST 29 CERTIFIED EXAMPLES IN TOTAL - WITH ONLY 2 IN XF 40 AND 1 OTHER IN 45 (NO PQ'S!). 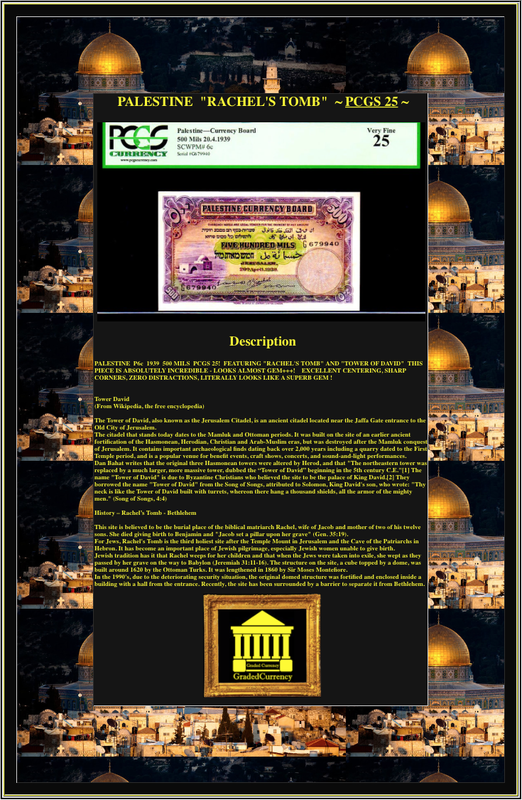 THE HISTORICAL SIGNIFICANCE OF THIS PIECE IS MONUMENTAL - FOR CHRISTIANS, JUDAISM AND MUSLIMS. 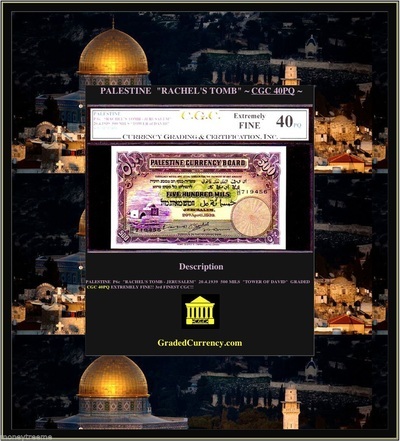 ALSO SIGNIFICANT ARE THE 500 MILS (RACHEL'S TOMB - JACOB'S WIFE), THE 1 POUND (TEMPLE MOUNT- DOME OF THE ROCK (BUILT BY KING SOLOMON/ HOUSE OF THE "ARK OF THE COVENANT" - WHERE JESUS VISITED, AND WHERE PROPHET MUHAMMAD'S JOURNEY TO THE HEAVEN-IN Qur'an). ALSO THE CRUSADER'S FOUND THE BONES OF "SAMEUL" THE BIBLICAL PROPHET, WERE DISCOVERED IN THE CEMETARY WITHIN RAMLEH, NEAR A JEWISH SYNAGOGUE (AS WRITTEN BY RABBI BENJAMIN OF TUDELA IN 1163). THE WHOLE SERIES IS SPECIAL REMINDER OF A VERY SIGNIFICANT HISTORICAL PLACE FOR ALL HUMANITY! IT IS QUITE A HONOR TO BE ABLE TO OFFER SUCH A PRECIOUS TREASURE IN THE OPEN MARKET FOR ALL TO ENJOY!